Can Stem Cells Treat Paralysis? First Big Test Underway. 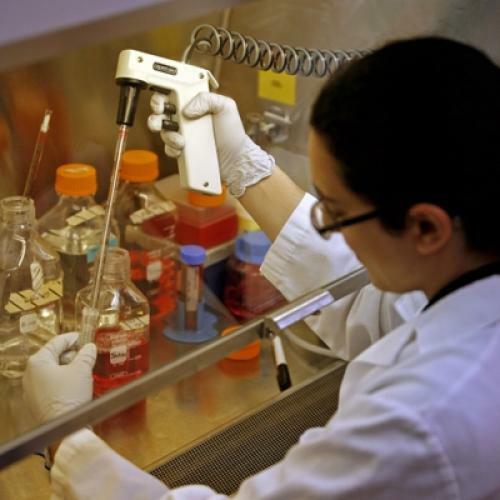 You may have read about the first FDA-approved test of embryonic stem cells in humans. What's actually happening? And what does it mean for the stem cell debate? The basic idea is to grow nervous system cells (called oligodendrocytes) from human embryonic stem cells, and then transplant those into an injured spinal cord so that they can help nerves grow back. Geron, which is sponsoring the trial, has tried the treatment in rats. In 2005, the company reported in the Journal of Neuroscience that they had transplanted cells derived from human embryonic stem cells into the injured spinal cords of some rats; the rats’ nerve cells then regrew a protective sheath more quickly, enabling the rats to move their paralyzed limbs again. But that was only true when the researchers injected the cells seven days after the injury. When they waited ten months, the rats saw no benefit. Scientists paid attention: That study has been cited by other papers almost 250 times, according to Thomson Scientific’s Web of Knowledge, which is a lot in five years. One of those studies, for example, showed that a similar set of cells, derived from adult mouse stem cells, could help paralyzed rats if they were transplanted two weeks after the injury, but had no effect if the transplant came eight weeks afterwards. With all of that in mind, the FDA approved a pilot study of the treatment in humans within seven to 14 days of a spinal cord injury. But plans for that study were put on hold after Geron found cysts growing in the spinal cords of the rats that got the treatment. Given that stem cells, by definition, grow like wildfire, and turn into lots of other kinds of cells, the concern was that the cysts could be a sign of cancer. This summer, after more studies, the FDA gave final approval for 8 to 10 people to get the treatment, at the Shepherd Center rehabilitation facility in Atlanta, Northwestern in Chicago, and several other sites. It was at Shepherd, on Friday, that the first patient got the treatment. The study is a Phase I trial, which means it’s really only designed to see if the treatment is safe or not. If it is, Geron would still have to show a benefit in two more phases, in more patients, before the FDA granted approval to market the treatment. Keep in mind that the road of medical progress is littered with the promising results of animal trials. It will also be watched carefully by critics of embryonic stem cell research, two of whom sued the National Institutes of Health to stop federal funding of it. A federal appeals court said such funding could continue while the case continues. The Geron experiment wouldn’t be subject to such a ban, since it is privately funded. If it demonstrates safety, however, it could put more pressure on Congress to eventually make more funding available, subject to the outcome of the lawsuit. Ivan Oransky, MD, is executive editor of Reuters Health. He also blogs at Embargo Watch and Retraction Watch.